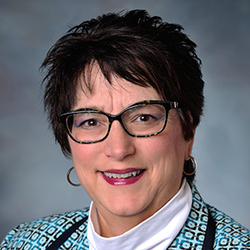 As a member of the Aultman Health Foundation team for more than 30 years, she has had a variety of responsibilities in the clinical arena including leadership roles as a Nurse Manager, Assistant Vice President of Management Development, Hotel Services and Medical Nursing and was promoted to a Vice President position accountable for Maternal Child Nursing. Prior to joining the Aultman College leadership team, Vi was the Vice President of Human Resources. In her current role as the Vice President of Community Engagement, she has responsibility for recruitment, community relations, philanthropy and diversity. A graduate from Kent State University with an Associate of Applied Sciences in Nursing, Ashland University with a Bachelor’s of Science in Nursing as well as a Masters of Nursing degree from the University of Akron. Ms. Leggett has served on various committees and Boards throughout the community and is currently an active member of the Northeast Ohio Association of Fundraising Professionals Board of Directors, the Akron Canton Regional Food Bank Endowment Board and advisory boards of Stark State College of Nursing and Massillon High School nursing career prep program. “Being part of Aultman College is exciting,” she states. “Aultman College has a passion for student success and is constantly evaluating avenues for enhanced educational opportunities”. In her time away from work, she loves shopping, reading, spending time with family, scrapbooking and the television drama This is Us. Married for a “very long time” to her husband and they have one daughter who lives with her husband and family in the Columbus area.